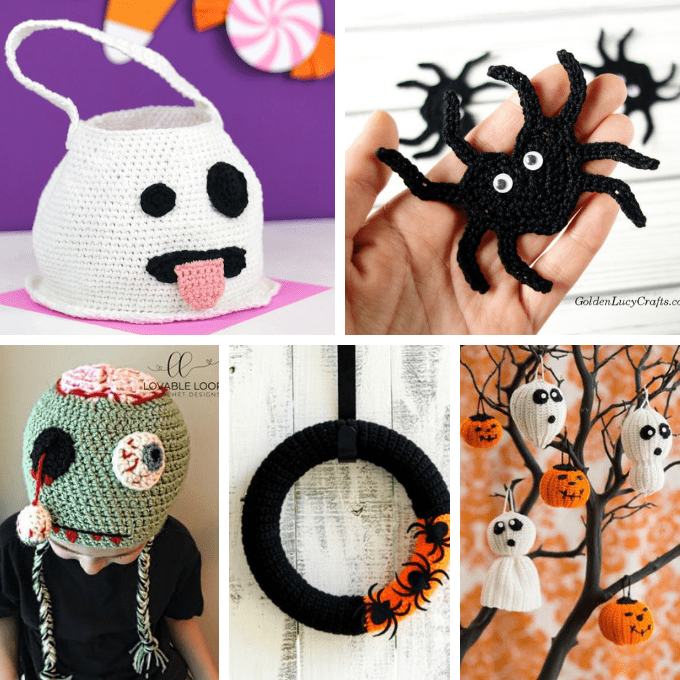 A roundup of 25 awesome free crochet patterns for Halloween. Geez. 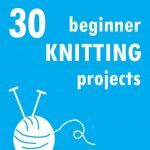 For someone who doesn’t know how to crochet (or knit, or sew really), I sure do share a lot of sewing-related crafts. I have crochet envy. I envy those of you who can pull out some needles and yarn and create gorgeous, homemade masterpieces. 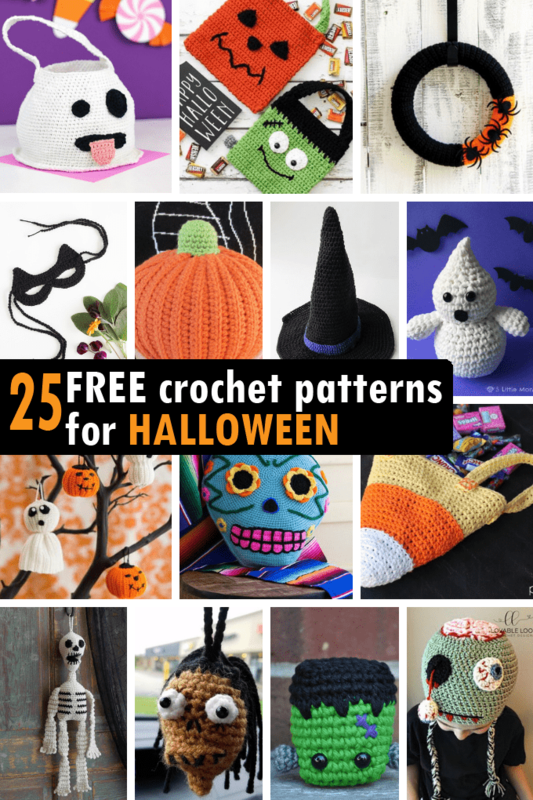 This roundup of 25 free crochet patterns for Halloween is for you, then, clever crafters. The cuteness! Find the free emoji ghost crochet bag pattern at Persia Lou. Add this cute crochet spider applique from Golden Lucy Crafts to anything. Ohmygoodness, this zombie hat from Loveble Loops is genius! I’m in love with this Halloween spider wreath by Olives and Okra. 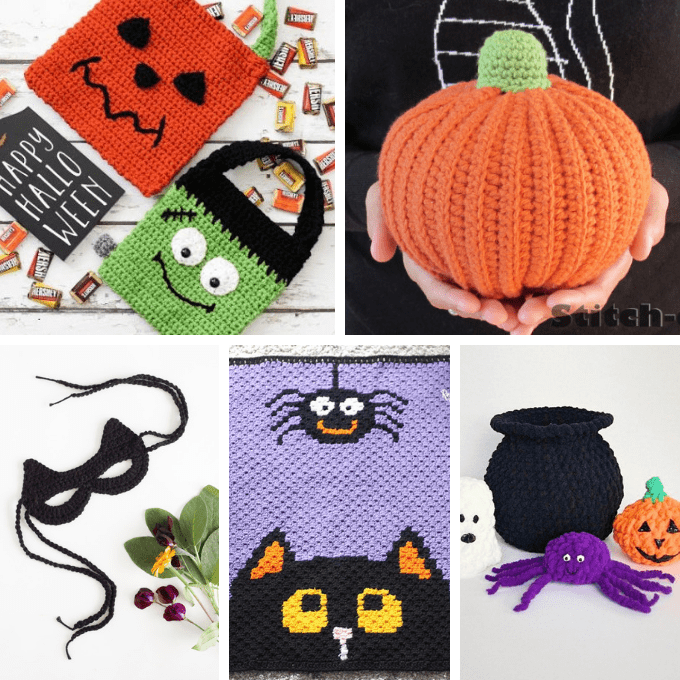 I love these crochet trick or treat bags from Sewrella. 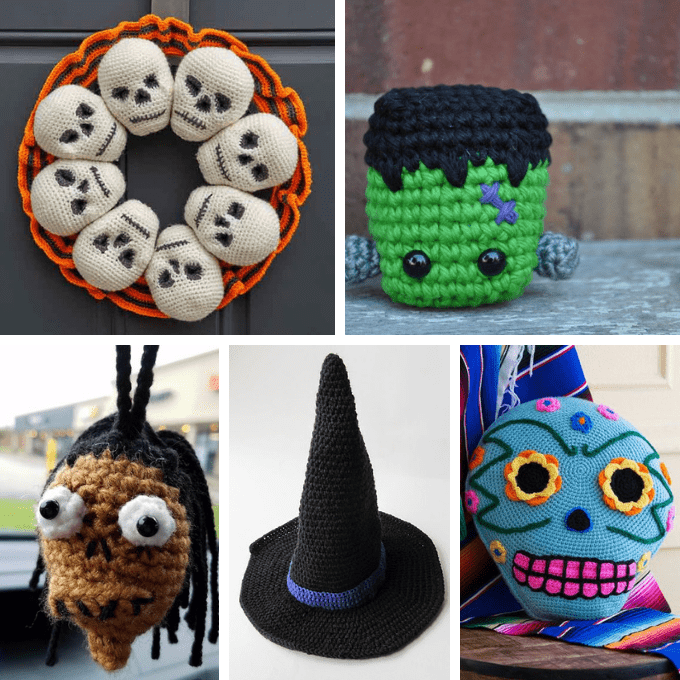 You’re going to need a crochet pumpkin, of course, by Stitch-em. I love the idea of a crochet cat mask, by Delia Creates. Crochet a Halloween blanket, from Repeat Crafter Me. Get the pattern for this cauldron filled with goodies at Left in Knots. 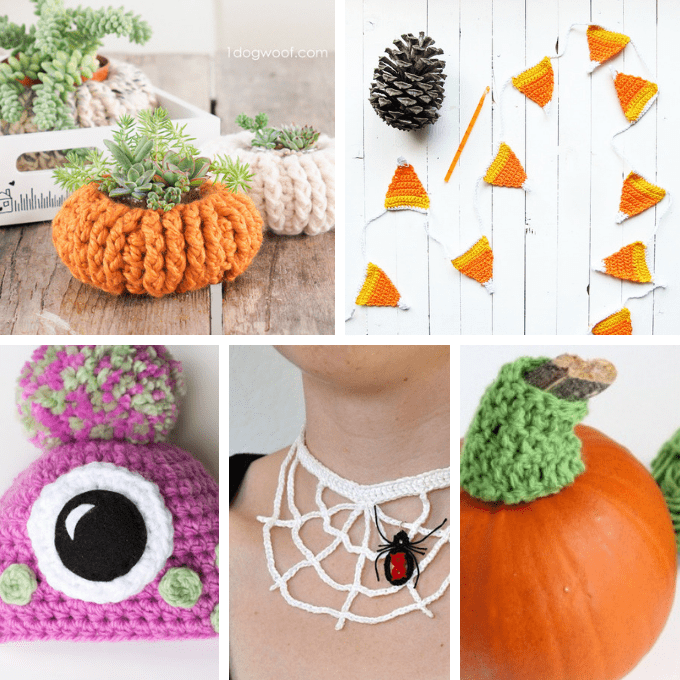 These crochet pumpkin plant holders from One Dog Woof work all fall long. Make some candy corn garland, at Little Things Blogged. Eek! It’s a crochet monster hat! By Hopeful Honey. Fabulous for a costume, crochet a spider web necklace from instructables. Now this is just practical. Make a pumpkin stem cozy at Make and Takes. Check out this crochet skull wreath, at All Easy Patterns. This little crochet Frankenstein from Turtleweenies is adorable. This shrunken head pattern from Mommy Made Crochet is fantastic. Crochet yourself a witch hat, at She Knows. Find this Day of the Dead pillow at Red Heart. Make a candy corn trick or treat bag, from Persia Lou. 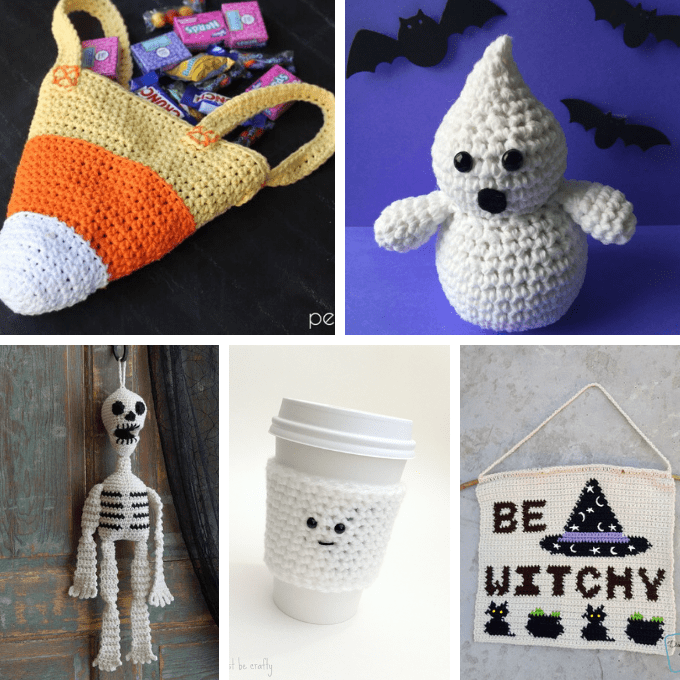 Crochet a ghost, from 5 Little Monsters. Or try this hanging skeleton. Coffee addicts might need a ghost coffee cozy from Just Be Crafty. For my fellow witches, make this Be Witchy wall hanging at Divine Debris.